Phil Bernstein from Addy Bassin's MacArthur Beverages, one the great Wine Stores in Washington DC, presented his new wines to the Capital Chapter of the German Wine Society of America. So, you had a combination of two - American consumers who are really into German Wine and one of the best retailers in the American market. The wines were extremely skillfully selected. Phil really knows what he is doing. And again, as last year, the wines selected by Phil reflected very well what the American market wants. We tasted, with one exception, only Rieslings, no dry wines, all wines had a touch of sweetness, no red wines and wines mostly from the middle Mosel. All wines were from very well established winemakers - from the cream of the crop. Johannes Leitz is this year’s Gault and Millau winemaker of the year. See here. Helmut Doennhoff was just awarded the Best German Dry Riesling Award by the Feinschmecker. See here. Ernst Loosen is among the top 16 German winemakers in the Feinschmecker WeinGuide 2011 (with Doennhoff). See here. There are about 50.000 winemakers with more than 0.5 hectares and 5.000 winemakers with more than 5 hectares of land, of which about 1000 are listed in the Gault Millau WeinGuide 2011, including all the winemakers whose wines we tasted. So, we were in the 2.5% top echelon. These were all wines with a touch of sweetness. There were no dry wines among the wines tasted. I recently attended the 1st International Riesling Symposium at Schloss Rheinhartshausen in the Rheingau in Germany, where they had usefully categorized the wines into four groups: (1) Aged Rieslings, (2) dry Rieslings, (3) Rieslings with a touch of sweetness and (4) lusciously sweet Rieslings. Phil Bernstein’s wines were all in the category of wines with a touch of sweetness. Wines with a touch of Sweetness – what are they? To start with, there are the nobly sweet Beerenauslese, Trockenbeerenauslese, Eiswein and Schilfwein wines from Austria and Germany, the Sélection de Grains Nobles from France, the icewines from Canada and other wines, made from botrytized, dried or frozen grapes. The grapes that go into these wines have such a high sugar content that there is nothing you can do to make dry wines out of these grapes. They inevitably produce nobly sweet wines. But apart from these exceptions, which account for only a tiny share of total production, Riesling grapes in Germany, Austria, Alsace, the US and Australia have normal sugar content at the time of fermentation and tend to produce dry wines, when fully fermented. However, modern cellar methods allow winemakers – in particular in Germany - to produce wines with a bit of residual sugar with these grapes. There are principally two methods applied in Germany – but not in neighboring Austria - for making these wines with a touch of sweetness. First, you do not let the fermentation run its course and stop it. As a result, you get less alcohol but also some sweetness in the finished wine. The sweet and low alcohol Mosel wines have made this approach famous in the whole word. Second, you let the wine fully ferment to a normal alcohol level without any remaining sweetness and then add Suessreserve (sterilized juice) to achieve the desired degree of sweetness. The wines with a touch of sweetness have lost popularity in Germany, although there are some signs of a comeback. The Germans overwhelmingly produce and drink dry wines. But the wines with a touch of sweetness remain popular outside of Germany, notably in the US market. Two of the three German wines on this year’s Wine Spectator Top 100 List belong into this category: St-Urbans-Hof Riesling Kabinett Mosel Ockfen Bockstein 2009 and Schloss Vollrads Riesling Kabinett Rheingau 2008. There were no noble sweet wines - the German flagship wines, the noble sweet Beerenauslese, Trockenbeerenauslese and Eiswein, made from botrytized or frozen grapes. Of course, they are expensive and this explains why they were not included in the tasting, although they would have been much appreciated. There were no Grosses Gewaechs (Erstes Gewaechs) wines. This is a new category of wines introduced a few years ago with the view of pushing super premium dry wines. Grosses Gewaechs wines are at a minimum Spaetlese and mostly Auslese wines, but fully fermented and bone dry … and expensive, of course. The Grosse Gewaechs label is thought to resemble the Grand/Premier Cru designations in neighboring France. Here and there, these wines are bone dry. Grosses Gewaechs refers to a top dry wine from a top vineyard. What is very confusing is that the Grosses Gewaechs wines are – as a rule – marketed as a QbA wine. One implications of this is that they can be chapitalised (as the Grand Cru and Premier Cru wines from neighboring France are). All the wines were Rieslings. Of course, Riesling is the king of German wine. But there are other grapes, which are popular in Germany, like Silvaner or Grauburgunder. We indeed tasted one very interesting Silvaner. But overall, these other white grape varieties are largely absent from the American market. American lovers of German wine go mainly for Riesling, sweet Riesling. 2009 Dr. Loosen Riesling "Dr. L."
Johannes Leitz is the current winemaker of the year (Gault Millau WeinGuide 2011), based in Ruedesheim in the Rheingau. I visited him last year. Ernst Loosen is among the top 16 German winemakers in the Feinschmecker WeinGuide 2011. Leitz Out and Dr. L. are wines where Johannes Leitz and Ernst Loosen buy the grapes from other growers. Leitz Out is produced only for the American Market, while Dr. L. is available in all export markets. In fact, Dr. L. is Germany’s best selling wine worldwide. Both are very good entry level wines from two outstanding German wine producers. “These are two very food friendly wines. They go very well with the kind of food we eat today” said Phil. 2009 Krueger Rumpf Riesling Feinherb "Schiefer"
Weingut Krueger Rumpf is a 3 Gault Millau Grapes producer in the Nahe region with 20 hectares of vineyard area. “In the last couple of years, the quality of the wines of Krueger Rumpf has increased. This is in my view mainly due to the fact that son Georg Rumpf has become more involved and basically taken over the winemaking” said Phil “he is very good”. I fully concur. What does “feinherb” mean? This is a new term that is being pushed to replace “halbtrocken” (off-dry). Initially, I thought this was a very exciting flight: same vintage, same vineyard, same grapevariety, same ripeness level of grapes at harvest, but different winemakers. It turned out that Robert Eymael from Weingut Moenchhof has been leasing Weingut JJ Christoffel Erben. But the wines were quite different. These were excellent wines, but Weingut Moenchhof and Weingut J.J.Christoffel Erben do not play in the same league as Doennhoff, Leitz and Loosen, and Krueger Rumpf (a bit behind the former three in my view). Two outstanding wines from an outstanding winemaker. The main question for the audience was if they would pay about the double amount for the Auslese (reg. $65), compared with the Spaetlese (reg. $32). What I heard from the tables next to me was “no”. Anyway, two incredible Mosel Rieslings, a fascinating flight. The only difference here was: a different vintage. You had a baby in one glass – “ a baby that shows a tremendous amount of potential” as Phil said – and a senior citizen, a bit aged but still in extremely good shape, in the other glass. This comparison also showed very well what the 2009 Riesling would give you in 10 years down the road. I love aged wines and for me the 2001 Doennhoff Kirschheck Riesling Spaetlese was the highlight of the evening. 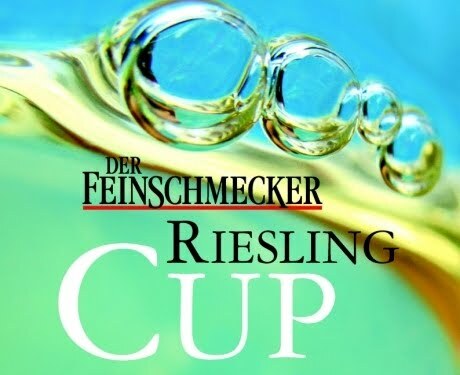 The German Food and Wine Magazine Feinschmecker presented the winners of the Deutscher Riesling Cup 2010 – Germany’s best dry Rieslings - when I was in Germany. The wines were from the 2009 vintage. Here is the link to the Feinschmecker article in the February 2011 issue. For last year's Riesling Cup – the 2008 vintage wines - see here. Again, a winemaker from the Nahe region, a smaller wine region, got the gold medal: Weingut Hermann Dönnhoff, Oberhausen for its 2009 Niederhäuser Hermannshöhle Riesling QbA trocken Großes Gewächs. Already in the two previous years, Weingut Schäfer-Fröhlich from the Nahe had topped the list last year and Weingut Kruger-Rumpf, also from the Nahe, in the year before (followed by this year’s winner Weingut Hermann Dönnhoff). Pictures: Christian G.E.Schiller with Tim Froehlich (above) and Georg Rumpf (below). The Nahe region is named after the river that traverses the valleys of the forested Hunsrück Hills as it flows toward Bingen on the Rhine . The vines grow along the Nahe River and its tributaries Glan and Alsenz. Although the Nahe is one of the smaller German wine regions, its extraordinary range of soil types is second to none. It has about 4400 hectares under vine. Almost 2000 years ago the Romans brought wine-growing to the Nahe. White wine grapes dominate with 3/4 of the total; Riesling is the most common variety with roughly 1/3 of the total. Here are the top 11 wines. The tasting took place in November 2010 and 355 wines had been submitted. Picture: Christian G.E.Schiller and Joel Waite,the winemaker and owner of CAVU Cellars in Walla Walla in Washington State. I had the pleasure of meeting Joel Waite in Washington DC, the winemaker and owner of CAVU Cellars in Walla Walla in Washington State. In the beginning, white wines were dominating. As recently as 10 years ago, 70 percent of the grapes planted were white grapes, with Chardonnay the No. 1 grape. 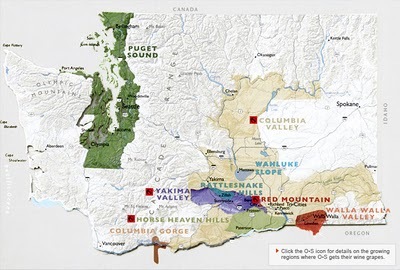 But encouraged by the success of Oregon with its Pinot Noirs, the balance between white and red wine has shifted towards red; red wines now account for almost half of the wine production. CAVU Cellars is a relatively new, family owned and operated boutique winery in Walla Walla. CAVU Cellars is owned and run by winemaker Joel Waite, with the help of his parents Jim and Karen Waite. Annual production is about 1100 cases of mainly red wines. CAVU Cellars does not own any vineyards and buys all grapes. Jim and Karen Waite grew up in Alaska, where Joel was born. But Joel spent the first part of his live moving around in the world as his father Jim became an army pilot, before settling with his parents in the Washington DC area. There, Joel started his career in the wine and beverage industry, initially as a waiter and barkeeper and later in the retail end of wines at some of best fine dining establishments in Washington D.C., including many years as a private chef and caterer. After a trip to Seattle, Joel visited his relatives in Walla Walla. He fell in love with Walla Walla and signed up for a winemaker program at the Center for Enology and Viticulture in Walla Wall. After he had learned the art and craftsmanship of making fine wines, he was hired as assistant winemaker at Maryhill Winery, about 2-1/2 hours from Walla Walla. In 2008, Joel moved back to Walla Walla and established CAVU Cellars with his parents, who in the meantime, after Jim’s retirement, had sold their Virginia house and also moved to Walla Walla. With a location of CAVU Cellars at the Walla Walla Airport, and Jim being a former army pilot, the idea of an aviation theme seemed a natural. CAVU is an old aviation weather acronym that means ‘Ceiling and Visibility Unlimited’. Pilots always like seeing that acronym on their weather forecast as it means a good flying day. Jim took me through his current portfolio. Cases Produced: 201 $35. This bold, aromatic wine, from Les Collines Vineyard in the Walla Walla Valley, has a concentrated spectrum of flavors that provide beautiful balance and structure. It has a silky mouth feel and long finish. Cases Produced: 266 $20. Crafted from grapes grown at Lonesome Spring Vineyard, this wine has undergone tank and barrel fermentation yielding a clean and crisp acidity with an array of citrus and passion fruit notes. The mouthfeel is well-balanced with a hint of vanilla. Cases Produced: 290 $26. A 93% Cabernet Sauvignon and 7% Petite Verdot blend, this wine has a soft tannic structure showcasing the intense aromatics and flavors of these Walla Walla Valley grape varietals. Cases Produced: 340 $30. This bold Italian varietal comes from Alder Ridge Vineyard in the Horse Heaven Hills AVA. It's upfront cherry aromatics are met with bold and spicy flavors. Sure to be a favorite for those looking for a fun food wine. Cases Produced: 259 $30. A 100 percent Malbec from Verhey Vineyard in the Columbia Valley, selected from two sites in the vineyard. Each block was fermented with different yeast strains and barrel aged prior to blending. Aromatics of blueberries, passion fruit and orange peel are a prelude to blackberry, cherry, and all-spice components. Weingut Wohlmuth is one of the top wine producers in Austria. They are rather export-oriented. Their US importer is Artisan Collection. From January 31 to February 6, 2011, Artisan Collection took their winemakers on a tour in the US, with stops at New York, St. Louis, Los Angeles, San Francisco and Washington DC. I had the pleasure of meeting Gerhard Wohlmuth jun. at the stop in Washington DC. Weingut Wohlmuth produces in the Mittelburgenland as well as in Suedsteiermark, where the original wine estate is located (in Kitzeck-Fresing). The wine estate has been owned by the Wohlmuth family since 1803, and is currently run by Gerhard sen. and Maria Wohlmuth, the seventh generation in line. The eighth generation, consisting of Gerhard jun. –who I met in Washington DC - , Daniela and Dieter, is also already fully involved in the business. The vineyard area in Kitzeck-Fresing totals 35 hectares. 75% of the area is planted with the white varieties including Sauvignon Blanc, Welschriesling and Riesling; the remaining 25% is planted with the red varieties including Blaufränkisch, Zweigelt and Cabernet Sauvignon. Since 2003, Weingut Wohlmuth has also vineyards in Neckenmarkt in the Mittelburgenland. The vineyard area there totals 19 hectares, with holdings in the renowned Hochberg and Rabenkropf sites. The wines are fermented at Neckenmarkt, and then taken to Kitzeck-Fresing for aging. The winery produces 240,000 bottles a year and exports 50% of its production to 20 countries, mostly European and North-American. Gerhard Wohlmuth sen. was awarded Austrian’s Winemaker of the Year 2001 by the renowned Falstaff magazine. “In the vineyard, soil management and the encouragement of natural predators to control vine pests are the key elements” Gerhard jun. said. As harvest approaches, the optimum picking date for bringing in physiologically ripe fruit is discussed and decided upon by the whole family. Then, several manual picks are made to select berries unaffected by the rot - the prerequisite for producing razor-sharp whites. The fruit is then taken to the press house, where it is crushed and further processed in small tubs. That is the moment at which important decisions are made: Squeezing and/or destemming? Whole-bunch pressing? Maceration for a couple of hours or minimal skin contact? The fermentation takes place in stainless steel tanks or in French barriques at controlled temperatures. It was fun to taste the wines and talk with Gerhard jun. “I have been involved in viticulture from my earliest childhood” he said. “From the age of fifteen, I started to train my palate with my father’s help. I took every opportunity to taste the most different wines from all over the world and share my impressions with him. Thus, I learned very quickly how a wine should taste and how not. Initially, I was, of course, deeply impressed by those concentrated New World offerings and could not understand my father disagreeing. But I had soon discovered that, although they (and many recent European wines) are highly concentrated, they lack real depth. And so I began appreciating more and more wines displaying finesse and subtlety” he continued. In 2000, he did his first internship at Oskar Sturm Winery in Friuli. That winery is known primarily for its fascinating and complex Sauvignon Blancs, but they produce some promising reds too. After this, he got a job at La Strada Fromm Winery in New Zealand. “Since La Strada ranks among the leading Pinot Noir producers of the world, I soon fell in love with this highly sophisticated grape” he said. The third practical training took him to South Africa, to the Rupert & Rothschild Winery. “There, I was deeply impressed by the perfectly thought-out vinification facilities” he said. A wide spectrum of wines is produced in several ranges. (1) The Classic White Wines South Styra range is fermented in stainless steel and bottled early. These are Weingut Wohlmuth’s entry level white wines. (2) The Single Vineyard White Wines South Styria is the premium white wine range. The top of the premium white wines are marketed as Elite wines.Grapes are picked at must weights in the Auslese range, and the wines are matured in barriques of French and American oak. (3) One red wine range is the Red Wines South Styria range. The red blend „See me” is very popular, made from Cabernet Sauvignon, Merlot and Zweigelt. Schilcher is also produced. In addition, bottle-fermented sparkling wines are produced. (4) The other red wine range is the Red Wines Neckenmarkt-Burgenland range. For those in the U.S., the wines of Wohlmuth are fairly well distributed, with the Artisan Collection being the national importer. The Artisan Collection belongs to the group of new importers of wines that are heading off the beaten track and discovering some wonderful wines that we would otherwise never see. The Artisan Collection was founded in 2003 is owned by Florencio L. Navarro. Florencio's family has made and sold wine in Spain for four generations. Mainz is, along with Bilbao in Spain, Bordeaux in France, Cape Town in South Africa, Christchurch in New Zealand, Firenza in Italy, Mendoza in Argentina, Porto in Portugal and San Francisco in the US, one of the 9 wine capitals in the world. When you choose a wine tavern, several factors come to play: (1) The setting and atmosphere of the place, (2) the people you might share your table with, (3) the kind of food that is served and (4) the wines that are offered. Weinhaus Bluhm used to be a popular hang for young people with little money and the fans of the local football club Mainz 05, not necessarily interested in wine. This has changed over the the past 7 years since Silvia and Roland Ladendorf have taken over and shifted the focus to top class wines. It has become popular with people from the regional government (Rheinland Pfalz), professors of the Mainz University and journalists of the ZDF (one of the two large state channels in Germany). My hunch is that the quota of these people is rather high. The quota of out of town people and tourists appears to run close to zero. Roland Ladendorfer is a wine enthusiast. He has put much thought into his selection of wines which includes both famed and lesser know producers. Most of the producers he knows personally. He is very passionate about his wines and this is one of the reasons that make Weinhaus Bluhm a very special place. Before taking over Weinhaus Bluhm, Roland Ladendorf was a a fruit and vegetable importer in the Frankfurt Grossmarkthalle. He was born in Gonsenheim, a suburb of Mainz. Picture: Weinhaus Bluhm with Roland (right) and Silvia Ladendorf (left). My wife started out with a glass of Sekt from Raumland. The 1997 Raumland Dalsheimer Bürgel Pinot Brut Prestige was just nominated best Sekt of the Year (Gault Millau WineGuide Germany 2011). Roland carries this Sekt. Germany is one of the largest sparkling wine markets in the world, which is not well known around the world. Germans drink lot of sparkling wines. One out of four bottles of sparkling wine produced in the world is consumed in Germany, roughly 500 million bottles. Sekt is made in all German wine regions, both in the méthode traditionnelle and charmat method. Raumland belongs to the smaller German Sekt producers. Raumland makes a bit of still wine but is clearly focusing on his world class Sekts. The Raumland Sekts are like Champagnes, without copying them, say his fans. NOMA in Copenhagen is arguably the world’s best restaurant currently, ahead of El Bulli in Spain and The Fat Duck in London. During the month of November 2010, Noma offered a German Wine dinner. It included a 2008 Scheurebe from Wagner-Stempel. See more here. During the afternoon, among others, I also had a 2008 Klaus Peter Keller Riesling von der Fels trocken for Euro 4.90 in the 0.1 liter. Klaus Peter Keller is one of the top 16 German wine makers in the Feinschmecker ranking. See here. I finished off the afternoon with a Michael Teschke Blaufraenkisch trocken 2007 in the 0.2 glass for Euro 4.50. The wines of Michael Teschke are very special. Michael is pushing the autochtone grape varieties of Rheinhessen, in particular the high-yielder Silvaner, and is not following the general trend of planting Riesling or “international’ grape varieties such as Merlot. Michael Teschke is a bit “crazy’ in his pursuit for bringing out the quality of a – in the view of many – mediocre grape variety to its best. With his pony tail, Michael Teschke presents himself like a 68er. He is also a poet and publishes poems on his web site. I not only like his wines very much, but also his poetry. The Teschke Estate is a family business now in the 3rd generation. The Teschke family comes from an area that since the Second World War is no longer Germany . Michael Teschke took over the Estate in 1998 at the age of 30 after the untimely death of his father. The 7 hectares of land are planted partially with vines that are already 50 years old. I have reported about Michael Teschke here. If you not want to climb up in the heights of wine pleasure you can also stay with the basic Schoppenweine, served in the Mainzer Weinstange for Euro 2.20 for 0.25 liter. Bodegas San Prudencio from Rioja in Spain is a new kid on the (wine) block. Their US importer is Quality Wines of Spain. From January 31 to February 6, 2011, Quality Wines of Spain took their winemakers on a tour in the US, with stops at New York, St. Louis, Los Angeles, San Francisco and Washington DC. I had the pleasure of meeting Ruben Saenz-Lopez, co-owner of and winemaker at Bodegas San Prudencio from Rioja at the stop in Washington DC. “This is my first time ever in Washington DC and my second time in the US” said Ruben. Located on the Iberian Peninsula, Spain has over 1 million hectares of vineyard land planted. It is with Italy and France in the leading trio of wine producing nations. In terms of consumption, Spain is 9th worldwide with Spaniards drinking, on average, 10.06 gallons (38 liters) a year. Wine growing and making in Spain began many centuries ago, even long before the Romans came. During the Roman Empire, Spanish wine was widely exported and traded. Following the decline of the Roman Empire, under the Moors, Islamic dietary laws that forbid the use of alcohol, prevailed. In the wake of the Spanish Reconquista in 1492, Bilbao emerged as a large trading port. Spanish wines became popular in England. A major turning point occurred in the mid 19th century when the phylloxera epidemic ravaged European vineyards-most notably those of France. With the sudden shortage of French wine, many countries turned to Spain. Phylloxera eventually reached Spain, but by the time the Spanish wine industry felt the full force of phylloxera, the remedy of grafting American rootstock to the European vines had already been discovered and was utilized. The end of the 19th century also saw the emergence of Spain's sparkling wine industry with the development of Cava in Catalonia. The late 1970s and 1980s saw periods of modernization and renewed emphasis on quality wine production. Spain's reputation entering the 21st century was that of a serious wine producing country that could compete with other producers in the world wine market. • Vino de Mesa (VdM) - These are simple, table wines. • Vinos de la Tierra (VdlT) - This level is similar to France's vin de pays system. • Denominación de Origen (DO) - This level is for the mainstream quality wine regions. Nearly two thirds of the total vineyard area in Spain is within the boundaries a DO region. • Denominación de Origen Calificada (DOCa) - This designation, which is similar to Italy's Denominazione di Origine Controllata e Garantita (DOCG) designation, is for regions with a track record of consistent quality and is meant to be a step above DO level. Rioja was the first region afforded this designation in 1991 and was followed by Priorat in 2003, and Ribera del Duero in 2008. Bodegas San Prudencio is a winery in Moreda (Rioja Alavesa), owned by Ruben Saenz Lopez and his brother since 2005. They have 85 hectares under vine and produce 500.000 bottles annually. Ruben Saenz Lopez, who I met in Washington DC, is the winemaker. He is in his early thirties and has a Ph.D. in chemistry and enology from the University of La Rioja. The name of the winery is related to the monastery of San Prudencio, a historic building whose ruins can be seen in Clavijo, where Ruben Sáenz Lopez family originates from. In a small family winery, Rubén Sáenz Lopez got his first exposure to the vine growing and wine making. It was in Clavijo that the Saenz Lopez brothers used to get as little boys into oak vats to clean them. Ruben made his first wine at the family winery in Clavijo before acquiring – with his brother – the Bodegas San Prudencio. Some of the vineyards are in Montelaturce, the landmark mountain in Rioja. These are some of the highest altitude vineyards in Rioja -- you can virtually see almost all Rioja from these vineyards. All of Rioja’s traditional varieties are grown: Tempranillo, Garnacha, Mazuelo and Graciano. The harvest is done by hand. French and American oak is used for aging. Ruben brought 3 wines, all Cueto wines. Cueto is sourced from vineyards beneath Mount Cueto, around the village of Clavijo, place of birth of the brothers Saenz Lopez – hence the name. Cueto was the first wine produced by Bodegas San Prudencio. BOUQUET: Fine, fresh berry fruit and well integrated oak. FLAVOR: Smooth, balanced, silky dark cherries. Maceration: 10 days + 15 days post-maceration with lees. Light filtration. Aging: 5 months in French (80%) and American (20%) Oak casks. No filtration. Aging: 8 months in French (80%) and American (20%) Oak casks. No filtration. With my fellow EWBC 2010 wine bloggers, I visited Suedburgenland with the objective of being introduced to the wines of Suedburgenland, led by Wine Journalist Julia Sevenich. Several wineries caught my attention. One of them was the start-up winery StephanO – a small winery owned and run by the Salzburg-based couple Prof. Dr. Killer-Oberpfalzer and Dr. Stephan Oberpfalzer. I had the privilege to chat a bit with Stephan Oberpfalzer and enjoy his wonderful wines. Already during the bus drive from Vienna to Burgenland, the American-borne wine journalist Julia Sevenich (picture left), who now lives in Austria, introduces us to the region: With 14.500 hectares of vineyard land, Burgenland encompasses four sub regions: Neusiedlersee (Lake Neusiedl), Neusiedlersee-Hügelland, and Middle and South Burgenland. The spectrum of Burgenland wine ranges from great white wines and full bodied red wines to an array of noble sweet wines. The shallow Neusiedler See (Lake Neusiedl) is one of the few places on earth where noble rot attacks grapes reliably every year. At the same time, there has been a red wine revolution in Austria during the last 20 years and increasingly Austria’ top red wines tend to come from the Burgenland. With 500 hectares of vineyards, the Südburgenland is the smallest sub area of the Burgenland – and one of the smallest in Austria. Südburgenland is bordered in the east by Hungary and Slovenia, and in the west by the Austrian states of Steiermark and Niederösterreich. “Suedburgenland is probably the most unspoilt wine landscape of Burgenland” Julia said. Eisenberg, which has significant historical importance, and the Weinberg of Deutsch-Schuetzen together form the region’s winegrowing center. Authentic red wines are produced here, predominantly from Blaufränkisch, that display subtle mineral spicy notes. Approximately 150 hectares of Blaufraenkische are planted in Suedburgenland. Crisp and fruity white wines from the Welschriesling and Weißburgunder (Pinot Blanc) varieties are produced along the towns of Rechnitz in the north and Moschendorf in the south. The majority of winemakers are hobby winemakers, or supplement their income with another job. The average grower here has only a half a hectare of vineyards. There are only a hand-full of full-time winemakers. Only one Weingut has more than 20 hectares. Much of the wine is sold through the local Buschenschank wine taverns. Winemakers Krutzler and Schiefer were the first to achieve national and international recognition and lend inspiration to others in the area. Reinhold Krutzler founded the Deutsch Schützen Sixpack with five other vintners from his wine village dedicated to exploring the region’s terroir and making the best single-vineyard wines possible. “There was a time when international varieties were gaining in popularity in the region, but luckily as the young vintners came back from abroad, they realized that we had something very special here. With Blaufränkisch, we have an indigenous grape variety that is well adapted to our soils and climate and is capable of expressing our unique terroir” says Christoph Wachter from Weingut Wachter-Wiessler, who I also met on this trip. The region-typical Blaufränkisch has been authorised to carry the Eisenberg DAC Klassik designation from the 2009 vintage and the Eisenberg DAC Reserve effective from the 2008 vintage. Klassik: Submission of the wine to the Prüfnummer tasting commission from 1 June in the year following the harvest, and available to the consumer from 1 September in the year following the harvest; Reserve: Submission of the wine to the Prüfnummer tasting commission from 1 January in the second year following the harvest, and available to the consumer from 1 March in the second year following the harvest. Alcohol levels by vol: Klassik: min. 12.5 Vol % and max. 13 Vol %; Reserve: min. 13 Vol %. Weingut StephanO is an absolute newcomer. It is the child of the Oberpfalzer couple from Salzburg. Monika Killer-Oberpfalzer is a distinguished medical University Professor at the University of Salzburg and her husband Stephan Oberpflazer is a Ph. D. in business informatics. Weingut StephanO is not about earning a living. It is about a long cherished dream of two wine fanatics. The long cherished dream of establishing a winery eventually came true for the Oberpfalzer couple in 2008, when they purchased a bit more than a hectare of vineyard land in southern Burgenland. A year later, the Weingut StephanO was established and the planning of winery and the wine cellar began. In spring 2010, the vineyard right behind the winery was newly planted. On 23th July 2010, the construction works of StephanO winery started, with the completion of works scheduled for 2011. The vineyards of Weingut StephanO stretch across Deutsch-Schützen and Eisenberg. This is clearly about realizing a dream of a lifetime. But what about the technical knowledge you need to make wine? Stephan Oberpfalzer says: “I’ve yearned to be a wine maker for a long time. I’ve educated myself through courses and seminars. I was able to watch experienced wine makers in action. Now the time has come to apply the knowledge acquired and make the wines of the StephanO Estate.” I wish you from the bottom of my heart all the best. What I have already tasted was very promising. Trinculo – Blaufraenkisch, from vineyards that are up to 10 years old, earthy and mineral flavors, lively, with a bit of dark berries. Gonzalo – Blaufraenkisch Reserve, 16 to 18 months in French oak barrels, from vineyards that are 10 to 25 years old, velvety, with an elegant note, an intense attack of berry flavours, couple with some oak, starting with the vintage 2008, this wine will be marketed under the recently established Eisenberg Reserve DAC label.